This page has been visited 1891 times. Notice how we set the "flags" column to "seed" for both nodes. This ensures that the user location can safely boot with an empty dataset and be happy with it. 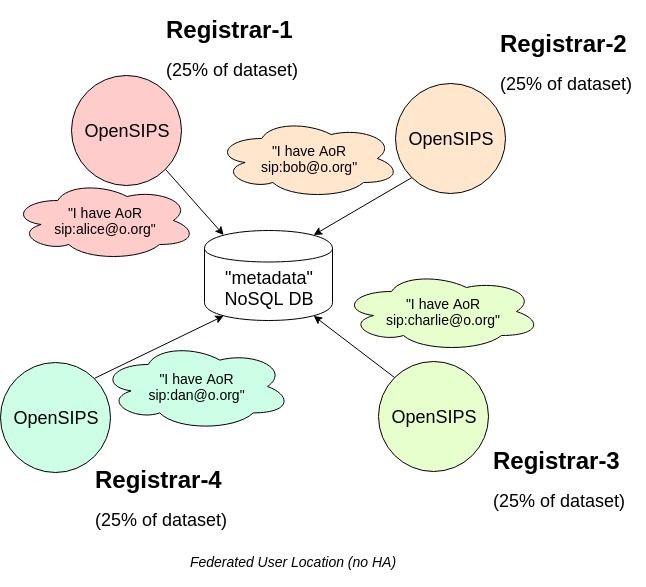 If we had left "flags" set to NULL for a node, when that node starts up, its user location module would have started looking for a healthy donor node, from which to request a full user location data transfer via cluster sync. 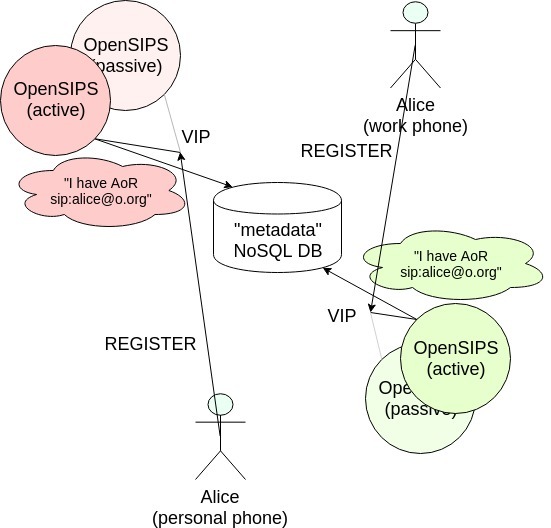 Also, the "sip_addr" column is equal to the SIP listener where we would like to receive traffic for the AoRs we've advertised as our own inside the NoSQL database. This is a usrloc-specific use case for "sip_addr" - other cluster-enabled modules may use this column differently or ignore it altogether. 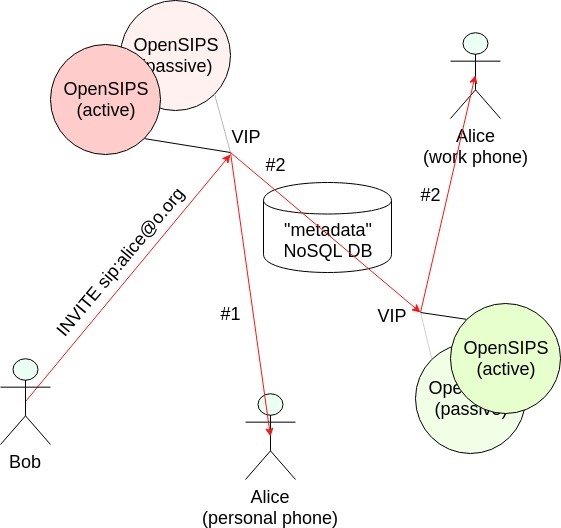 To achieve HA, notice how we group nodes in pairs using the "sip_addr" column. It now contains the Virtual IP address sitting in front of each pair. 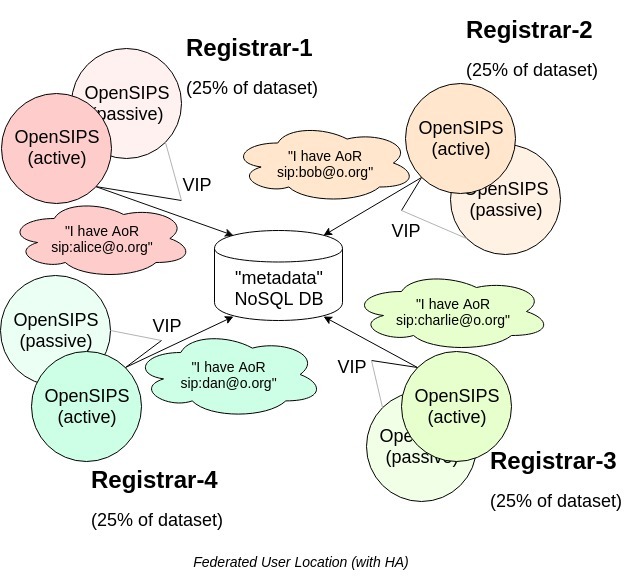 In federation mode, the user location will only replicate contact information to nodes with equal "sip_addr" values, in order to achieve the "hot backup" feature. Next, the "flags" column is set to "seed" on the active node, and NULL on the backup. This allows you to restart the backup node and automatically have it sync'ed up via cluster transfer. The "flags" column is ignored when using a local SQL database for restart persistency. We need not change anything in the default script in order to achieve the above. The working_mode_preset or cluster_mode module parameters take care of this. The "g" (global) flag indicates that the lookup() will not only perform the local lookup operation, but also do a NoSQL DB lookup and prepare additional branches for each returned result. Thus, we will fork the INVITE to both the callee's local contacts and to any cluster member that has previously advertised the AoR. Below is an example of a call that gets forked to a device local to the current PoP (branch #1) and to a remote PoP (branch #2), where the callee has registered a 2nd device.